Michelle reviews a little known feature called Space Station 76. "Dude. Dig my wall paper?" Space Station 76 is probably one of the most esoteric “concept films” made this year. It’s a modern science fiction movie that takes place in an idealized 1970’s version of the future—think films like Logan’s Run, THX 1138, and The Black Hole and you will have an idea of the aesthetic that is being referenced. To be honest, it’s an idea that would probably be more suited to a short film or a comedy skit, but director Jack Plotnick has managed to make it work as a full length film (for the most part). The film is billed as a “black dramedy” and the tone oscillates between overwrought drama and absolutely pitch black humor. 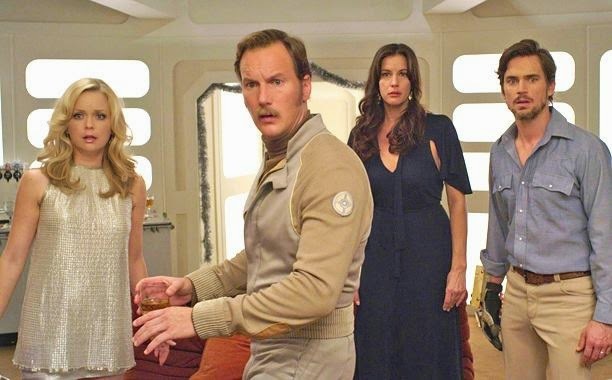 The entire movie takes place in the space station which is overseen by Captain Glenn (Patrick Wilson), a gruff alcoholic with impressive mutton-chops who is barely keeping the ship together after the abrupt departure of his co-pilot. He gets a new female recruit named Jessica (Liv Tyler) and we follow her interactions with the rest of the dysfunctional inhabitants of the station. For a film like this to work on a basic level, they need to sell the idea of it being a “retro-future” and nail all of the clichés associated with it. 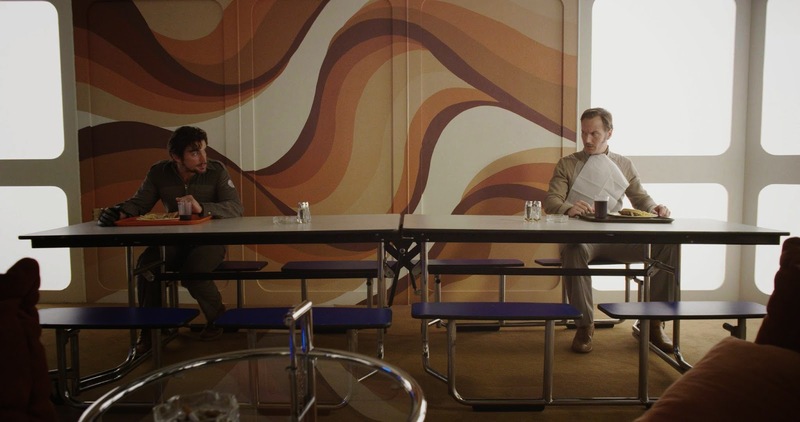 From the art deco wallpaper (complete with wood paneling), to the stark white Kubrick-esqe ship hallways, everything is spot on. The clothes are all vintage 1970’s styles with big bell bottoms and the requisite super-groovy space jumpsuits that the ‘70s were so fond of. All of the electronics are giant, blocky and analogue—it looks like everyone is using old Korg synthesizers for everything they do. One character has a clunky, robotic prosthetic hand that he has to plug in with a cord to recharge—little things like this really add to the charm of the film.The score is a mixture of sweeping orchestral music and spacy synth riffs and fits perfectly. There are always ambient square wave beeps and boops going on in the background which sounds like older video game sounds (like Atari or Intellivision). Black comedy is hard to do well, and Space Station 76 might go over the heads of some audience members. It’s not because it’s particularly clever, although it is well-written, it’s that whomever watches this movie has to be intimately familiar with a somewhat obscure genre of films to get all of the jokes. If you are in on what is going on, it’s hilarious, but if you don’t understand the references then the humor will seem tedious and out of place. This also applies to the melodramatic parts of the story too as old 1970’s space operas were full of that type of thing. Everything in this film is done dead pan and serious but with tongue firmly planted in cheek. The humor is also mean-spirited at times which might turn some people off. This type of humor isn’t everyone’s cup of tea. "Look at the size of that thing!!!" Everything in this film doesn’t work and the pacing of it is jumpy and a little scattered. It could have benefitted from tighter editing as the relatively short runtime still seems a little too long. They also don’t develop the characters enough and there are some side plots that get a strong start and end with in an ambiguous way. It almost seems as if the director wrote himself into a corner and didn’t know how to end the film. This isn’t enough to detract from the film too much but it does leave the viewer wishing for better closure to the story. If you happen to be a fan of this extremely specific era of genre film, then you will find much to like in this quirky little indie flick.